This past week, my littlest sweet girl turned one. I can’t even believe that I am no longer the mommy of a baby and a toddler, but TWO TODDLERS. Where on earth does the time go? For my oldest daughters 1st birthday, I thought it had to be a huge deal with a big party and lots of planning and preparation, favors, guests, invitations, the whole sh-bang. I quickly learned that although I have lasting memories from that birthday party and pictures that I can show her later on down the road, she really didn’t care about the size of her party. Plus, her 1-year-old friends could really care less that their friend was having a birthday. Let’s be honest, they were there for the cake and the toys. Plus, I was so stressed out trying to plan everything and make sure everything was perfect, that I forgot to have fun and celebrate the fact that my baby had reached a milestone. 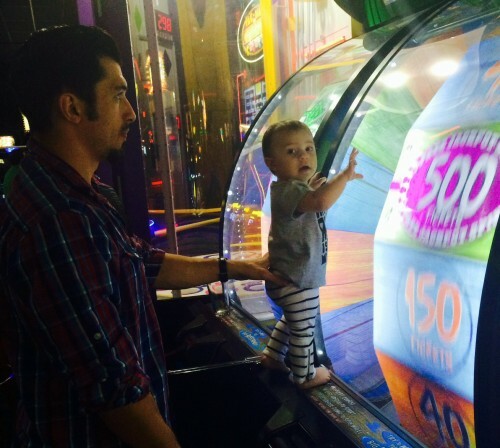 When my youngest daughter’s birthday came around this year, I tried to do it differently. I wanted to keep it small , easy, and make sure that the family friends whose faces she recognized and loves were there. I figured this was the most important part about a birthday for a little one anyways, surrounding them with their loved ones. Most of my family doesn’t live in AZ with us, but my husband’s family does which is so nice:) We had a separate small dinner with cake the weekend before so that her Papa could be there. 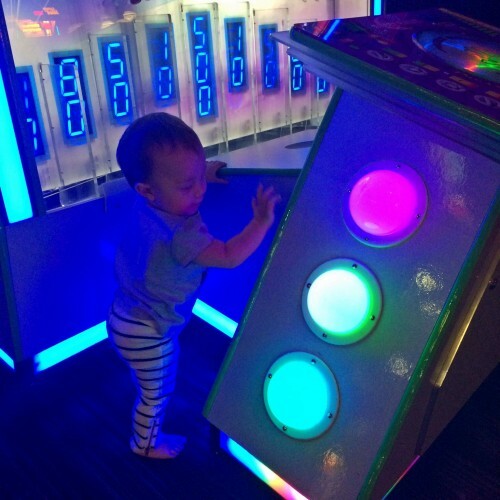 Then on her actually birthday, we all went out to dinner at Dave and Busters, which my little one was IN LOVE WITH because of all the lights from the games. Our closest family friends in Arizona were there as well. Her Auntie is the owner of Cakes Take Shape and an AMAZING cake decorator who has made all of the birthday cakes for my family (not to mention my wedding cake) in the past few years. 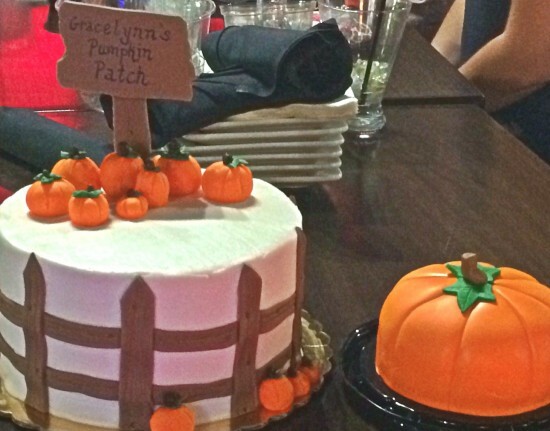 An October baby calls for a pumpkin themed birthday right? She was wearing an orange tutu to match her fall-themed pumpkin patch birthday, but we had some issues of car sickness as we were driving to her birthday dinner. Talk about mom problems… we had to run to CVS because we had used all the wipes to try to clean her and her sister up after they vomited all over themselves and the car as we are driving on the freeway. Then I had to run and find them new outfits at a store across from D & B so that we didn’t take them into the dinner covered in puke. I know that in some cultures and family traditions, first birthdays are the big one and it calls for a larger-than-life celebration!I think it’s awesome and I love attending/seeing pictures of those fantastic parties. But for us, especially since not all of our family lives in the same place, I think keeping it small and making sure that those who she will look back on and appreciate that they were there, join us in celebrating such a huge milestone! Whether you choose to throw a gigantic party or keep it small, my advice would be to do what you think is the best for your little one and what is the greatest way you can celebrate them. As moms, we sometimes get too caught up in throwing the biggest and best get-together and/or birthdays, or we are always in some silent competition with another mom to see who can be the better parent. I hate to burst that bubble, but no mom is better than another because they throw the largest and most expensive birthday party. I am absolutely not opposed to throwing larger birthdays as kids get older and they will remember and enjoy their party. No matter what, it’s all about doing it out of love for your child and the celebration of their life. Happy First Birthday To My Sweet Girl! Are you a “large party thrower”, or do you like to keep it small and family-style? I’m totally with you, I’ve done the huge birthday parties, and the small intimate family parities… I’ve enjoyed them both, but I love having less stress and more celebration. Happy Birthday little one!! I hear ya on the big party. I did that for my daughters first bday too! We ended up spending the next five birthdays alone at Disney Land just to avoid another party! LOL. That cake is SO great! Happy Birthday to your now big girl! Aww it’s so sweet! I am a mom who would like to throw big parties but it never works out that way. I’m not sure if I’m just not a great planner or if I get too stressed out. Either way, we have family/friends there and it always turns out great. As long as my girls have fun, I’m happy. Great post Joanna! To answer your question, I don’t know how to not go over board and stress on everything I do. Must be the perfectionist in me…. 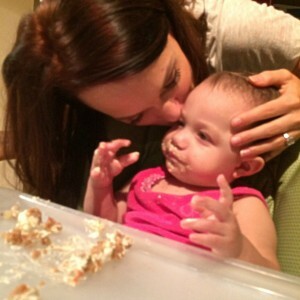 First birthdays are always so much fun!! Even if the little ones don’t remember, we do!!! Happy Birthday!! I almost always do more than i say I am going to do.. I just cant help myself!! This year for my daughters second we are going to do a little vacation (Disney or maybe Legoland?) so I dont get out of control! ha! Mini vacations are always a great idea I think! Every one tried to make me feel guilty because we didn’t have a big party for my daughter’s first birthday and I ended up not enjoying the day. So on her birthday, I made it fun for her and I. Good:) That’s what really matters anyway! How sweet! I have to admit I’m one for big birthdays but it really is more for us parents. As my kids have gotten older I let them chose what they want to do. My youngest will be 1 yr old on Christmas which is my favorite day of the year. I’ve been planning for months now so we can celebrate both on the same day. I love love love the cake! Aww, happy birthday to your little one! My daughter turns one in a few weeks, which I can hardly believe. We finally put together an evite for it. We’re inviting a bunch of friends and my husband’s small family, but we’re keeping it very low-key. Like you said, it’s all about celebrating her life! Oh… totally adorable cake(s?)! I’ve done large parties and small. I prefer the small because it reminds me of how simple things were when I was a kid when it came to birthday parties. Happy Birthday to your gorgeous girl! These are some great tips! EXACTLY what I need as I think ahead for when baby few weeks old and we already panning for future!